Editor’s note: Claire Swinarski is a freelance writer who specializes in wedding trends. She’s also a recent bride. When it’s time to start planning your wedding, it’s easy to become overwhelmed very quickly. The cake! The limo! The flowers! There are tons of decisions to be made, and everyone’s looking at you to make them. With the rise of bridal TV shows, the never-ending black hole of Pinterest, and the beautifully curated photos on Facebook, planning a wedding can seem like the most stressful time in your life. But if you break the wedding planning process into manageable steps, something that seems insurmountable can become exciting, simple, and even fun. The first step to planning your wedding? Consider the guest list. The number of guests in attendance will determine many factors later on. You can’t choose a venue without knowing the size of your wedding, and it’s much harder to select colors, catering or a photographer before you choose your venue. When you sit down to make your guest list, talk to your fiancé about his or her hopes. Does he imagine a small, intimate affair? Or does he have a huge, close extended family? Think about the people who are important to you as a couple. When planning my own wedding, my groom and I were confronted with the fact that most of his family members live in Europe and the cost of travel and stress of visas would be too great for most of them. On the other hand, we had a huge group of college friends who were very important to us and had witnessed much of our relationship. So we had fewer family members present, but danced the night away with college friends. Think of who matters to you, and make an Excel spreadsheet where you can start to gather addresses and RSVP information. Once you have a guest list, remember that, on average, only 75 percent of guests will be able to attend. That’s your guest number. So if you have 200 people on your list, you need a venue that will accommodate at least 150. This is also the time to consider your budget. Talk to your fiancé, parents and future in-laws to figure out who’s contributing what. The old tradition of the bride’s parents footing the entire wedding bill has mostly gone by the wayside. These days, families make budgets work in various ways. Some parents still want to be very involved financially, but some aren’t able to contribute as much. Once you have your budget and your guest list figured out, it’s much easier to get a better picture of what your wedding can look like. For instance, if your lengthy guest list is super important to you, but you know your parents aren’t able to chip in, you may need to opt for more affordable elements. Think chicken instead of steak and a wedding dress that isn’t by Vera Wang. There’s absolutely nothing wrong with that and you want to figure it out before you dive head first into planning. Every wedding is as beautiful as the couple’s love that goes into it and a higher price tag doesn’t equate to a better marriage. When working with a smaller budget, decide on a few areas that are your highest priorities and a few that mean less to you. When planning my wedding, my groom and I knew we wanted delicious food at our reception, an open bar, and a high-end wardrobe, so we saved a bit by choosing a DJ who was having a sale, throwing a barbeque for our rehearsal dinner, and skipping videography all together. The next step is shopping for a venue. Call and make appointments to tour prospective venues with coordinators. Some popular venues for receptions include hotels, museums, convention centers, restaurants, country clubs, and any other beautiful spaces in your community. Decide if you’ll be having your reception and your venue in the same location. If you plan to do the ceremony one place and the reception another place, be sure to consider the proximity of the spaces to one another. • How many people can it comfortably fit? • Do they have a caterer you’re required to use, or do they allow you to choose your own? • If it’s an outdoor space, what’s the rain plan? • What are the decorating possibilities? Is it an ornate space that won’t need much work, or a plainer banquet hall that’s going to require some imagination? • Who’s the coordinator you’ll be working with? Do you get a good vibe from them, as if they’d be accessible to answer your questions? • What’s the parking situation like? After your venue is selected, it’s time to get down to business. Ask the wedding coordinator at your venue if they have vendors like photographers, cake bakers or DJs that they recommend. Head to the wedding magazine rack at your supermarket and dive in for inspiration. Take that Pinterest board you’ve been hiding and see which ideas are actually feasible. Photography will be a large part of your wedding budget. It’s also one of the only things to remain after the flowers have died and the cake has been eaten. Selecting the perfect photographer is usually high on a couple’s priority list. • First and foremost, are they available on your wedding date? • How many hours are they available for and do they charge per hour? • Does their wedding package come with an engagement package? • Do they prefer to pose couples very specifically? Or are they more candid in style? • Have they ever snapped photos at your venue before? • What’s included in their price, in terms of printing? For instance, do you secure the digital rights so that you’re able to share the photos freely on social media and print them yourselves? Do they include a few complimentary prints? Tip: if you’re looking for photographers that have worked your venue before, Google your wedding venue (for instance, “Eastside Country Club wedding”). Many photographers will blog images from weddings they’ve worked, and this can direct you to those who know your venue well and already know the best spots for photos. It can also give you décor inspiration. Shopping for a wedding dress is something many girls have dreamed about since they were little. It’s not just about finding a flattering, pretty dress; it’s a milestone in your life and an emotional moment to share with other women in your life. When picking out your dress, be open-minded. You may have been envisioning your fantasy dress for years, but there’s no way to tell how it will look on you until you’re wearing it. I was the girl who had spent years imagining my perfect dress. But when I went shopping, the style I had thought would look great on me turned out to be unflattering. I decided to have a dress custom made so that it could incorporate elements I loved while working wonders on my body type. If I had gone into the process refusing to budge from what I had wanted prior to shopping, I definitely wouldn’t have felt nearly as beautiful on my wedding day. That being said, it’s good to do some research beforehand so that you have a place to start. Look over different types of cuts, like mermaid or ball gown dresses, and think about whether or not you like embellishments such as sparkles or lace. When deciding whom to bring with you, remember that you don’t need a huge entourage. Pick family members and friends who will be honest, kind and respectful of your style. Also, remember that dresses don’t need to cost a fortune. Even though this may be the most important outfit you’ll ever wear, it doesn’t have to cost thousands of dollars. Consider more affordable lines; chances are excellent that your guests won’t know the difference. The cost of decorating varies enormously, depending on your choices. Consider how your venue looks with minimal décor – does it need a lot of embellishment? If the answer is no, great! But if you’re looking forward to personalize your space in amazing ways, here are a few tips that won’t wreak havoc on your budget. When it comes to flowers, remember that seasons matter. Those gorgeous anemones floating around on Pinterest are mainly winter flowers, so finding them in summer is going to cost you. Flowers can eat up a huge portion of your budget, so make sure you keep your season in mind while working with your florist. One way to save on your floral budget? Repurpose! Bridesmaids’ bouquets can be used as décor for your head table. Flowers decorating the pews of your church can easily be slipped into vases for double duty reception centerpieces. Also, consider bucking the trend of giving readers, ushers and moms corsages. Thank them in your wedding program instead. Each corsage can cost up to $30. Utilizing hydrangeas and carnations is a good idea, too; these “filler flowers” are beautiful and affordable. If you’re going to DIY your florals, do a little research beforehand. My sister used to work at a country club, and one of her favorite horror stories involves a bride who forgot to remove the pollen from her flowers. She ended up with a yellow dress moments before walking down the aisle. Arranging your own flowers can be done but it’s not quite as easy as it seems. Watch some YouTube videos and read some gardening blogs to learn which flowers look best together. Another option would be to go with very simple flowers. Remember that some decorator items like lanterns, candleholders and wood décor can be purchased on Etsy and resold to other brides after your wedding. 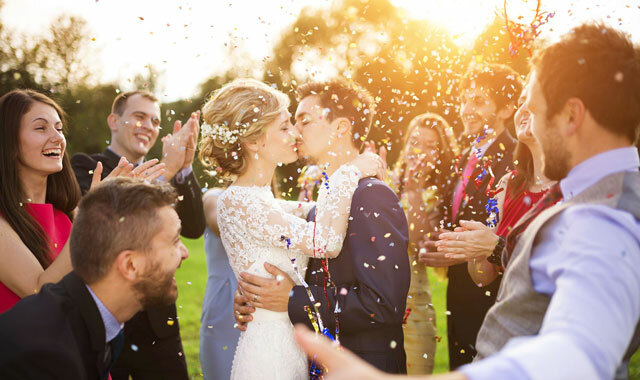 These days, there are no rules about what has to be in your wedding – except an officiant and witnesses, of course. Put The Stress Aside – And Enjoy! At the end of the day, planning your wedding shouldn’t be a headache. It should be an enjoyable, exciting period of time that leaves you and your fiancé excited for the next chapter of your lives. If at any time you feel like tearing your hair out, remember that the point of your wedding is to be united with your husband and to celebrate alongside friends and family. Things will go wrong, but as long as you end up married, nobody will remember that typo in the program or the unity candle that refused to light. All anyone will remember is the love between you and your new family – and that’s what it’s all about. Couples throughout the west and northwest suburbs are finding a unique and nearby wedding destination in Geneva. This March, area couples can make the connection for themselves during the 10th annual Geneva Wedding Walk, scheduled for March 5. The event is organized by Geneva Bride, a consortium of Geneva-area wedding vendors specializing in all aspects of the big day, from venues and rehearsal places to DJs, hair/makeup and everything in between. “We do pride ourselves on the high quality of our vendors,” says co-chair Kristen Kaven, a hair and makeup specialist with Montage Salon and Spa. Her business travels to weddings around Chicagoland and the Midwest, and even as far as Florida. Kaven’s co-chair, Tara Vanderheyden, leads Invitations by Design, a specialist in stationery. The day begins with registration at The Herrington Inn & Spa, where couples can stock up on many goodies, including entry into a Montego Bay honeymoon giveaway. Then, groups embark for a tour of vendors located around downtown Geneva. Those that aren’t stationed in the city’s quaint downtown will be on hand at Riverside Receptions. Moms and grooms-to-be are welcomed to join. Tickets are $25 in advance or $30 at the door, and they include entry for up to two guests. For tickets and more information, visit genevabride.com. This entry was posted on Wednesday, February 15th, 2017 at 12:00 pm	and is filed under Northwest Woman, Top Posts. You can follow any responses to this entry through the RSS 2.0 feed. Both comments and pings are currently closed.